If you've been wishing for Benefit to make a POREfessional foundation (I know I have! ), then today's your lucky day! They just released it on Sephora.com and it comes in 5 shades...not the biggest color range but if you're fair to medium-toned, you'll likely be able to find one that suits you. Target pore problem areas with the POREfessional: pore minimizing makeup. This long-wearing, matte makeup covers imperfections without clogging pores. The weightless formula reduces the look of pores and controls surface oil for up to eight hours. It’s infused with mushroom extract, known to visibly minimize pores. It includes a custom, built-in pore-blurring sponge to smooth on flawless, buildable coverage. 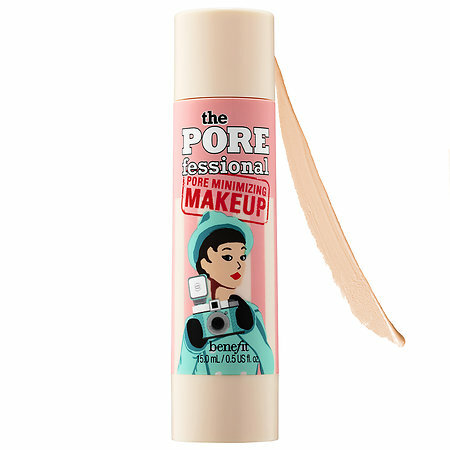 The POREfessional Pore Minimizing Makeup is available now for $30 at Sephora.com and in stores in June. I'll definitely check this out next time I'm at Sephora or Ulta. I can't help but continue to check out new mattifying makeup in hopes of finding THE ONE that'll mattify my face the longest.